I am always excited when past clients reach out after I shoot their engagement photos and weddings. In my work, it’s important to develop a relationship with each couple, so I love when a couple checks in with me for a session later in their relationship. It’s beautiful capturing the special moments of their big day and having the opportunity to see their relationship and love grow over time. 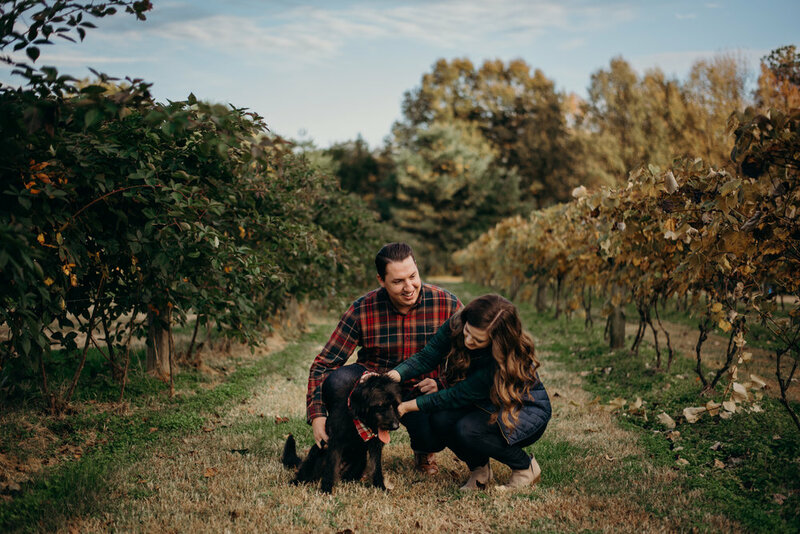 I had the pleasure of working with Joel and Katherine for their engagement session and their wedding in Fredericksburg this past April at the Kenmore Inn. It was such a picture perfect spring wedding day! A month or so ago, Katherine reached out to see if I’d be interested in doing a session for her and Joel with their new four-legged addition, Booker. Of course, I was interested! I absolutely love dogs. I have two of my own (Izzy & Lola), and they are oftentimes my favorite part of the day. So if you ever want to bring your dog along for some photos with me, it’s a yes. My answer is absolutely YES! Booker was awesomely behaved for such a young guy. Joel and Katherine brought along little treats for him, and he seemed to enjoy exploring a new place with his parents. Booker’s plaid bandana even matched Joel & Katherine’s shirts! Together, we explored most of Snead’s Farm, and wow we found some amazing little pockets of light. Check out how cute this family is together, and let me know what you think. If you’re looking for a wedding photographer, let’s set up a time to chat. Bonus points if you let me pet your dog!